The week before last, I was on vacation. “Holiday” as my friends across the pond and Down Under would say. Or as I like to call it, “staycation”, for it was a vacation where, rather than travelling someplace, I remained in my home town. Returning to work after a vacation (or holiday, or staycation) can make you feel a bit like a celebrity. “What did you do?” co-workers often eagerly ask, sometimes to determine how your time away compared to theirs and which of you is living higher on the hog; sometimes because they genuinely care about you and your goings-on. What did I do? I got together with friends; I went to the beach; I repainted my nails; I lounged on my couch with Netflix and made entire bags of Kettle Chips disappear while watching Death Comes to Pemberley (a Pride and Prejudice sequel – slightly mis-cast, but still enjoyable), Dredd (a truly alarming vision of future policing, plus not once did we get to see Karl Urban’s beautiful face), and Sherlock (OMG, so much love!). “And you wrote,” added those co-workers who especially care about me and know I’m into that sort of thing, not even phasing the statement as a question. I did write a little bit – a tiny bit: maybe four hours tops out of a possible 80 that were completely devoid of obligations and commitments not of my own devising, and that’s not even counting the weekend that immediately followed. Thus reiterating to me something I’ve known about myself for some time: I don’t really care to be writing when I have all the time in the world to do so. I work full time (plus a fair bit of overtime at certain times of the year), so my usual writing time is in the evenings after supper for two to two-and-a-half hours, the last thing before I go to sleep. I do this five days a week (Sunday through Thursday) and save my weekends for important things like watching more Sherlock, socializing, and all the mounting errands I should have done during the week but didn’t because I was busy writing. It’s a system that’s worked well for me over the past three years since I started writing again. I also employed it throughout my initial serious foray into writing during my grad school days, when I would attend classes or write my thesis during the day and then work on my WIP at night. I’m not exactly sure why I find it so hard to deviate from this pattern. Maybe it’s because, while I enjoy writing and have restructured my entire life to accommodate it, a lot of the time it just feels like more work, and when I have time off, I want to really be OFF. Or conversely, maybe, in keeping with North American cultural views on productivity, as much as I treat writing like my second, part-time job, since it’s yet to yield any monetary reward, I subconsciously consider it little more than a glorified hobby to which I don’t feel justified devoting even more of my limited spare time. Or alternatively still, perhaps rather than a job or a hobby, writing is my one true love – one which, like many a romance story, all too readily illustrates the contrariness and oversight of human nature in love. That is to say that writing feels most special and worthwhile when I have to fight to make time for it, for I don’t want what I want too easily or willingly. Perhaps the answer is some ever-shifting combination of all three. I can’t say for certain. All I do know is that vacation – either leaving town or staying at home – is a detriment to my creativity. Doubly so, actually, for not only do I cease writing during the actual time off, my progress during the week or so after I return is likewise affected negatively – my momentum halted, my ability to focus shattered, my sentences weak and slow to form in both my head and on the page. The problem with writing most every day – the problem with doing anything most every day, be it work or leisure – is that the muscles and mental processes it takes to do so occasionally get fatigued and suffer from overuse. I can only write as fast as I can think up and flesh out ideas for what happens next. Even with a fairly detailed outline, when it comes to sentence-level writing, I can’t write it until I’ve first heard the words in my head. Yet after months of constantly straining to hear that one clarion voice amidst a cacophony of distractions, eventually it all just starts sounding like white noise. It’s true the time immediately following a vacation is a fraught one; now so quiet inside my head with the playback of my story having been paused for so long, it’s timed out and gone to black screen. I always fear my inspiration gone forever – that I’ve squandered it on pretty boys on TV, or a day at the beach, or a chance to visit a far-off place from which my imagination chose not to return. But of course this fear is unfounded, for it’s within that same silence that the first whisper of a new idea is finally heard with even greater clarity than before I took a break. As well, while not directly conducive to writing itself, vacation – even a week just spent home on my couch – offers experiences that can be parlayed into writing in the most unexpected ways. So in conclusion, I’ve determined that vacations are both the worst possible and best possible thing for my writing creativity, and fondly look forward to my next one in the near (but not too near) future. What helps you maintain your creativity? Do you enjoy taking staycations? Which celebrity has a face you’d not want to see covered for the duration of a movie? Let me know in the comments. This entry was posted in Writing, Writing While On Vacation and tagged (I Should Be) Writing, Creativity, Ideas, Inspiration, Movies, TV, Writing inspiration. Bookmark the permalink. Yesterday, I forced myself to have a writing day off. No thinking about writing, no sitting down at the keyboard. I dedicated some strict reading time, which I don’t do enough of. It was great! Sometimes it’s good to give those trained routine muscles a break, even though you don’t feel mentally fatigued. And reading always helps to replenish those creative juices. You’re right, Isaac – a brief interruption to your routine, even if you don’t think you need it, can bring you back to your own attention and make you work more intentionally. Although I find that even when I’m not writing, I’m never not thinking about it, instead always viewing the world through the lens of how I can incorporate my experiences into a story. I like to go on real vacations which involve warm Caribbean or Pacific ocean water and the decision whether to turn over (which requires more suntan lotion on the other side), or not. And I like someone making unlimited yummy food available whenever I want it. And beautiful views. Unfortunately, it costs me a week of my life to get ready to go, the whole week of vacation to rest up from getting ready, and another week, minimum, to get over the effort required to take the vacation in the first place, so it isn’t a net gain. But I love me those pools and beaches. I know that you have special circumstances that make big vacations challenging for you, but even folks without chronic illnesses often need a “vacation from the vacation” after all the running around and trying to experience everything. For someone like me, if I actually want to rest (which I always say I want to do but then don’t), a staycation is probably the best bet. I’m on permanent staycation at present and what you say is true. Find the lack of motivation and structured time is totally detrimental to my writing. I have to get very “angry bored” to begin writing again. Structure is so valuable in getting things done, for it eliminates the decision fatigue of “Should I do A or B? When should I do B? For how long? Etc. When I have all the time in the world, I generally take the path of least resistance with regards to my writing, which is to just think about writing but not actually write a word. Staycations always go by so fast. But Vacations are too expensive. Holidays are way out of my league. I want to sleep for a week and start over, I think. Staycations are longer at least in that the time spent in transit from my bed to my couch is under ten seconds. I have a 2-week staycation coming up next month and I am SO going to write me a river. DO it, Roy! Show all us laze-cationers how it’s done. I’ve never been a fan of staycations, but I think that’s because I’ve had very few jobs with paid vacation time. If I was going to lose a few days of pay, it had to be for something worthwhile. Now that I finally have a permanent job (with paid vacation and other benefits) and am planning to buy a house, I expect there will be quite a few staycations in my future. But not the fun kind. The “I’m taking a week off to paint the house and replace the deck” kind. Rhonda, I’m so proud of you that you’re going to buy a house! Once you do, I’ll have to come visit you in your frozen northern wonderland (so long as you stock lots of wool blankets and maybe nudge the heat up for my benefit 🙂 ). Although you’re right: staycations do generally turn into “doing crap around the house”-cations. You don’t even need to own your home for that to be the case. I’ve heard Almost Human was good; I’ll have to add it to my list (so many shows to watch, so little time!) And yes, there is always Xena; as yet, I’m still only halfway through my re-watch (just finished season 3). 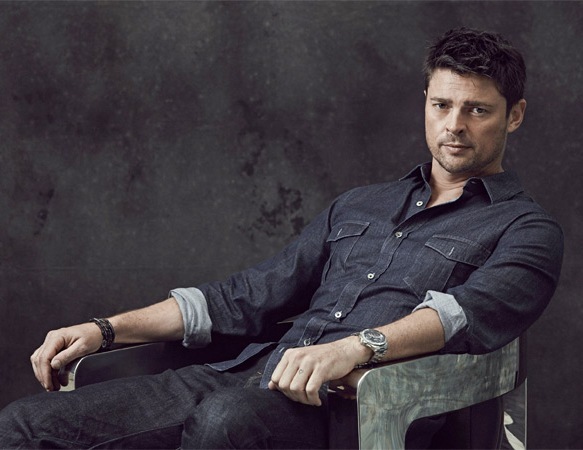 Karl Urban has played three different characters thus far.